The ruble slid on Wednesday to its lowest levels since 2016, as tensions with the United States over new punitive sanctions and the conflict in Syria eclipsed the benefit of higher oil prices. The Russian market has been in a sharp sell-off since the United States imposed new sanctions against Moscow on April 6, targeting some of Russia’s biggest companies and most prominent businessmen. Right after Trump’s statement, the ruble hit 65.06 versus the U.S. dollar on the Moscow Exchange, its weakest level since late November 2016, and losing more than 11 percent of its value since the sanctions were imposed. The U.S. president offered to help boost Russia’s economy and sought an end to what he called an “arms race,” in another tweet less than one hour later. While fundamental factors, such as the state of the Russian economy and macroeconomic policies remained unchanged, risk aversion towards Russian assets has soared in recent days. The market is now closely watching for an indication of how Moscow will respond to the sanctions and any future U.S. action in Syria. Russian Prime Minister Dmitry Medvedev said retaliation to the sanctions ought to be “appropriate”, but also that Moscow should look at imported U.S. goods and U.S. companies operating in Russia when considering its response. In an apparent sign that the ruble’s drop has caused concerns for authorities, the finance ministry did not buy any foreign currency for its reserves on Monday, central bank data showed on Wednesday. The central bank, which carries out daily FX purchases on behalf of the finance ministry, said in an emailed comment that purchases of foreign currency had a variety of reasons, including high market volatility. 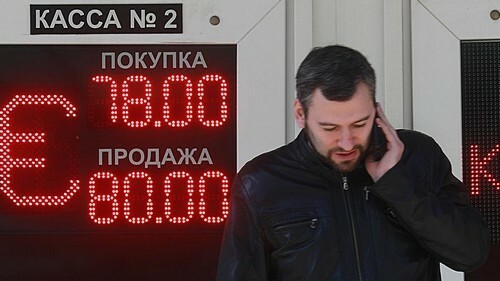 As of 1118 GMT, the ruble was 2.67 percent weaker on the day at 64.70. Versus the euro, the ruble shed 2.94 percent to slide beyond the psychological threshold of 80 to 80.14, a level last seen in March 2016. “Macroeconomic indicators suggest the ruble is massively undervalued,” Otkritie Brokerage said in a note. The market has largely ignored a rise in prices for oil, Russia’s main export. Brent crude futures rose to $71.91 on Tuesday and hovered at around $71.70 on Wednesday. “With the current level of oil prices, the ruble looks fundamentally undervalued: according to our model, USDRUB should be not higher than 58 now,” VTB Capital analysts said in a note. The impact of the latest U.S. sanctions against 17 senior Russian government officials, seven so-called “oligarchs” and 12 companies they own or control has spread across Russian markets. The sanctions triggered volatility and uncertainty, prompting companies to change their plans while also providing buying opportunities. Russian unit of Volkswagen Bank said it had postponed a planned bond issue worth 5 billion rubles ($78.34 million) due to unfavourable market conditions, Interfax reported. At the same time, Novatek, Russia’s largest independent gas producer, said it bought back 482,840 ordinary shares from the market on Tuesday. Shares in Novatek dropped to as low as 656.3 rubles on Monday, down from levels of around 770 rubles seen before the sanctions were announced. After a steep decline in the shares of Russia’s largest lender Sberbank, the bank’s top managers bought shares of the lender to the amount of 45 million rubles, according to a regulatory filing. Shares in Rusal, the world’s second-biggest aluminium producer, were down 2.3 percent on the Moscow Exchange . They have lost 34 percent of their value since Friday when the company was put on the U.S. sanctions list.